Percy St. Clair Priest, 88, of Cape Station and formerly of Upper Economy, NS, passed away peacefully on January 30th, 2019 at the Moncton Hospital with his family by his side. He worked as a Quality Control Inspector with the Ford Motor Company in Oakville, ON for 30 years. He was a member of the United Church of Canada. 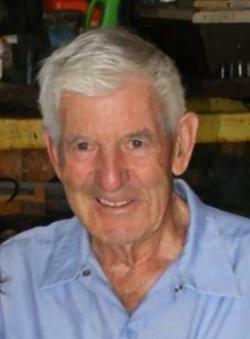 Percy loved sports, he played and coached hockey and baseball for years. He was a member of the Masonic Lodge, Corinthians Lodge # 63 and was very active in his community. He was a jack of all trades and enjoyed spending time in his garage fixing people's cars and anything that needed fixing , always giving a helping hand. He was an avid outdoorsman and spent a lot of time fishing and hunting throughout his lifetime. He was a worthy competitor when it came to cards, especially crib. Percy's main priority was his family, he loved them all so much. He was a devoted husband to Mary for over 67 years.He was Mary's caregiver for many years before her passing last year.He was a good role model for them to follow and he taught his children how hard work and love is what life is all about. He had a special place in his heart for all his grandchildren and great grandchildren, his face would light up when they came around. He was one of a kind and will definitely be remembered for his kind and caring ways. He was always available to help anyone. What we keep in memory is ours forever. He will be deeply missed by his children, Linda Favalaro (Christopher Whitehead) of Brampton, ON, David Priest (Shirley) of Cape Station and Alan Priest (Jody) of Huntsville, ON; his son-in-law, Jack Reid of Bomanville, ON; sister, Elizabeth "Betty" Elliott of Lower Sackville; brother-in-law, Headley Ripley of Clear Water, BC;sister-in-law, Beryl Wheeler of Sackville, NB; he will also be missed by his many treasured grandchildren and great grandchildren. He will also be missed by several nieces and nephews. Besides his parents he was predeceased by his beloved wife, Mary Amanda (Faulkner) Priest; his son, Donald Edward Priest; daughter, Teresa Reid; sister, Lois Ripley and half brother, Harvey McWhirter. Honouring Percy's own wishes there will be no visitation or service at this time. The family will be having a memorial service in Economy, NS at a later date.